Welcome to Appetite for Japan. I’m an Australian girl exploring (and eating my way around) some of the most interesting places in Japan. In particular, I enjoy places that are a little unusual. Appetite for Japan is a fast growing Japan travel blog which began in November 2014 when I realised that I could help people plan their Japan trips by sharing information about the quirky places I visit in Tokyo and beyond. If you’ve ever searched for “themed cafes in Japan” or even “weird restaurants in Japan”, you will have noticed that way too many articles are written by people who haven’t actually visited these places. At Appetite for Japan, I only write about places that I’ve personally visited, and I aim to provide useful information to help people add exciting and unusual places to their itineraries. But it’s not just about food; my ‘appetite for Japan’ encompasses a broad range of interesting places and activities, and this is what you can expect to find here. 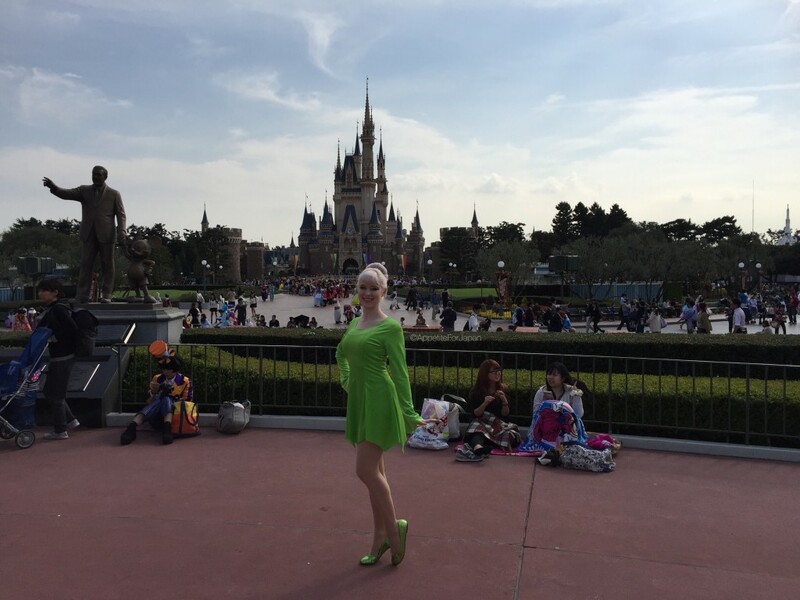 Above: That’s me during Halloween at Tokyo Disneyland. Appetite for Japan is something which I work on in my own time on the side of a full time job and a part time master’s degree. I generally add a new post each week – usually on Saturdays. From time to time I also write for other websites including Madman Entertainment, and my work has been featured on a number of sites including (but not limited to) Rocketnews24, Nerdapproved, Dorkly, The Daily Meal and ComicBook.com. The vast, vast majority of my posts are self-funded, allowing me to write honestly about every place that I visit. Running a blog like this does involve money (and a lot of time! ), and I recoup some of these costs via Google Adsense and the occasional collaboration such as a sponsored post. In the case where I have received some kind of benefit for writing a post, I will always make this clear within the post itself. Any post for which I have received any sort of benefit will be written honestly, and I will only write on topics that I have a genuine interest in and would benefit my readers. If you are interested in collaborating with me in this capacity, please contact me via the form at the bottom of this page. Companies that I have recently worked with include The Financial Times, Cardloan Girls and Hikkoshi More. All of my photos are my own, except on occasion when I will use a photo from a company’s own site (for example, if they do not allow customers to photograph their restaurant), and in this case I will clearly credit them for it. Should you wish to use any of my writing or images, please contact me first in order to request permission. I can be contacted via the form at the bottom of this page. You can also find me on Facebook, Twitter, and Instragram. Last but not least, if you’d like to get in touch and/or leave any feedback, please feel free to comment on my posts or use the below form.